Schloss Egg was built in the 11th century in the valley of the Mettenbach as a Wasserburg (water castle). Egg is first mentioned in 1103 as the seat of Thiemo de Ekke. The Ecker died out in 1403. In 1427, Castle Egg was sold to Henry (Wittelsbach) XVI of Bavaria. 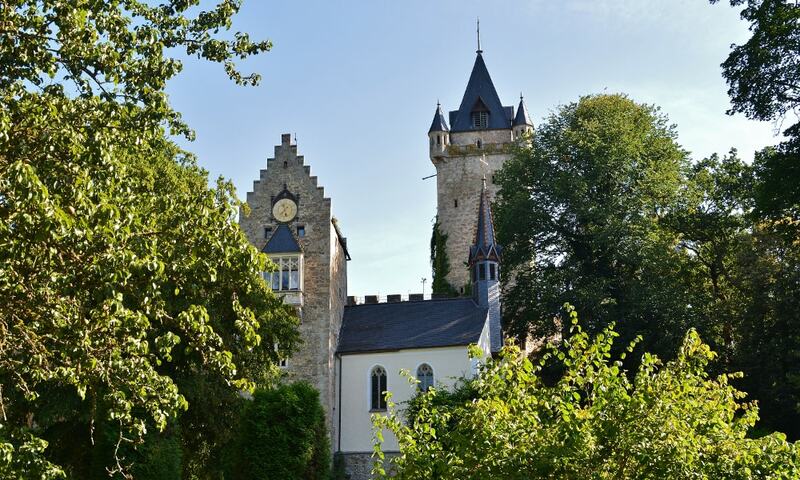 The Castle has changed hands many times and is now owned by the Hartl family. Castle Egg is a completely preserved medieval castle complex, around which the former moat draws. The surroundings were romantically transformed: in addition to the relocation of the original access, additional "weirs" were rebuilt in the 19th century. Originally decorated ballrooms and salons from the 19th century can still be visited today. The complex was renovated by Count Joseph Ludwig von Armansberg from 1838 to 1842 under the direction of architect Ludwig Foltz of Regensburg. The castle was decorated with medieval-style "ornaments", such as gables and turrets. In 1839, the old wooden bridge was demolished and replaced by a new one, consisting of several stone arches. The tower of the Castle is 45m high and contains an oubliette. The castle also contains a chapel built in 1349. The former stables (Burgstall) of the Castle have been converted into a hotel and restaurant. I have visited many castles throughout Europe and this is one of my favourites. Schloss Egg has a beautiful setting on the edge of the Bavarian Forest. The view from the tower is beautiful. The rooms in the Palace of the Castle are extraordinary and have been beautifully preserved. The Castle is best experienced by staying overnight and enjoying a great meal from the restaurant on its patio in the shadow of the Castle.